That's no Santa Claus, that's Ian Anderson making merry! NOW the truth is told. The real Father Christmas is alive and well - in Jethro Tull ! 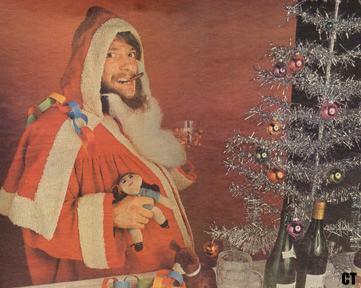 The real Father Christmas is Ian Anderson, or vice versa, with particular emphasis on the word "vice" ! "Christmas message to our fans? I don't think we've got one. I don't even celebrate Christmas !" Well that's a fine admission from the red-cloaked man who squeezes down your chimney every year. "I only really celebrate by sending Christmas cards. But thanks all the people who bought our records and who came to see us - everything's exciting, and we'll come and play for you again in the New Year." Jethro Tull had a lot of plans for 1970 - but most of them have been scrapped. Anyway, they are in the middle of recording a new album and there are plans for a single in January. The album should have been completed yesterday (Monday, December 22). There is a Scandinavian tour planned for next month; Germany is possible in February, and they return to the States after that. "There are also a couple of TV shows being fixed up, and another album - our fourth - will be out in August or September. But I don't really know anything about it - we let the people in the office do all the worrying. I just write tunes, sleep, wake up and write tunes. Of course, we'll be playing some dates in England." 1969 was a good year for Jethro Tull so Ian really has got something to celebrate at Christmas. What will he be doing? "Well, Tuesday I'll be shopping for presents, Wednesday I'll blast up to Blackpool to see my parents and we'll just say 'hello' and exchange presents, and on Boxing Day, if there are any trains, I'll be coming back to London. "I've got a lot of tunes to finish and quite a lot of work to do. Last Christmas Day we spent rehearsing."